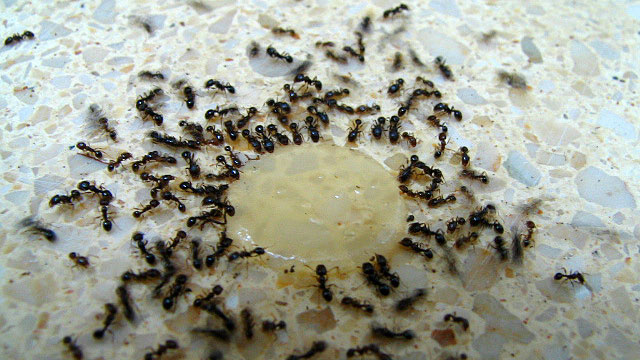 Melanie Pinola — When ants invade your home, it’s time to battle. You don’t have to use ant baits with pesticide in the traps, however, since there are several natural solutions to getting rid of ants and keeping them out. Probably the most commonly used ingredient in house ant control is Borax. Previously we’ve suggested a 50/50 solution of Borax mixed with sugar placed in a small cap, since most ants are drawn to sweet things. Jonathon Hatch writes on Get Rid of Things that the sweet-based ant baits work for getting rid of Sugar Ants (a.k.a. House Ants or Pavement Ants; those little brown ants that make mounds in the pavement), Pharaoh Ants (golden ants with voracious appetites), and Argentine Ants (long dark ants). If you live in the south where red fire ants swarm or have carpenter ants, unfortunately insecticides seem to be most effective. Besides Borax, you could also sprinkle a baby powder firewall near the ants’ point of entry to make ants inside your home lose their scent trail, get lost, and eventually die. Put cucumber slices near cracks or entry points because ants apparently hate cucumbers. Draw chalk lines around your doorways and windowsills—as with the baby powder, this may work because ants don’t like particles sticking to their feet. Put bay leaves or sprinkle cayenne pepper where the ants are coming in; according to Planet Green, ants hate the scent of these. Make a cleaning solution of vinegar, water, and about ten drops of tea tree oil and spray it around your counters/doorways/etc. Also similar to the baby powder trick, this makes ants lose their scent trails and stop coming around (hopefully). Regularly cleaning up in your kitchen, taking out the trash, and sealing door sills and window sills are also all good measures. Have any other ant control suggestions? Let’s hear them in the comments. Photo by Shira Gal.